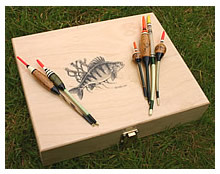 Pine Float boxes either supplied plain or Individually hand illustrated, these beautiful wooden float boxes make the natural partner for your cherished hand made float collection. locking clasp. Lined with green felt they come complete with positional inserts, to keep your favourite floats in perfect condition. 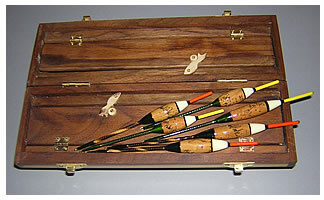 The Float box includes 10 floats of your choice. Click here for further details on floats. Similar construction to the float case but a lot smaller. This reduced size fits into the pocket quite comfortably. 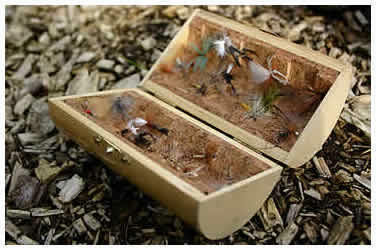 The interior of the case is cork lined with cork strips allowing a selection of your favourite flies to be safely and conveniently carried. 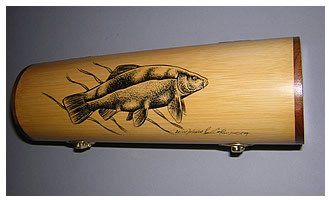 These are built from a length of large diameter bamboo, approx 10" long. The tubular section is then split into two halves, thus creating lid and base. 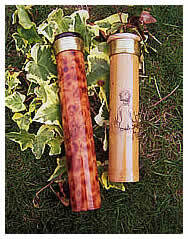 The ends are capped with American walnut and shaped by hand to the curved shape of each end of the bamboo sections. 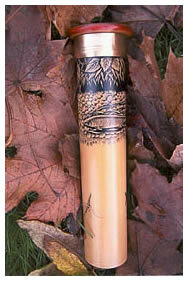 The bamboo edges are finished with a thin strip of walnut which gives added strength and compliments the case. On the inside of each half section is a hinged door of walnut which is hinged and has a bamboo fish shaped handle. Once opened the door reveals a compartment which holds floats of varying sizes. Double brass hinges and catches are fitted to the outside of the case, whilst the lid is decorated with an illustration of the customers preferred fish. The case in the finished in polished lacquer. Finished in polish lacquer and signed. Hand illustrated in Indian ink with an illustration of the customers choice. All ink illustrations are individually drawn making each one unique. Small 8" Medium 10" Large 12"